The influence of Eustachian tube (ET) dysfunction on the inner ear fluid pressure and thus on the inner ear function in Meniere’s disease has been discussed controversially. So far, most of the studies examining ET function in inner ear disorders indirectly analyzed ET function by tympanometric methods. The present study directly studied ET function in inner ear disorders by sonotubometry. Healthy subjects and patients with Meniere’s disease, sudden sensorineural hearing loss, cholesteatoma and chronic suppurative otitis media were examined by sonotubometry. Mean increase of sound pressure intensity (dB) and mean duration of sound pressure increase (s) were analyzed. Highest mean increase of sound pressure intensity was seen in healthy subjects when using >5 dB peaks (11.6 ± 0.7 dB) and >0 dB peaks (9.6 ± 0.6 dB). Comparative analysis including bilateral ears showed decreased ET function in patients with cholesteatoma (p = 0.002) and in patients with Meniere’s disease (p = 0.003) when using >0 dB peaks. 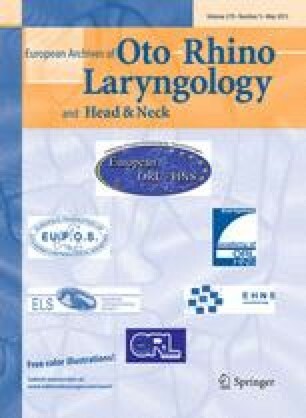 Examination of each specific ET opening maneuver showed impaired ET function in pathological ears of patients with cholesteatoma and with Meniere’s disease, during yawning (p = 0.001; p < 0.001), dry swallowing (p = 0.010; p = 0.049), Toynbee maneuver (p = 0.033; p = 0.032) and drinking (p = 0.044; p = 0.027). Mild ET dysfunction is detected in patients with Meniere’s disease by direct sonotubometric assessment of ET function.